An innovative Rotherham start-up has filed a patent application for the manufacturing of a new breed of plant growth chamber that will revolutionise the ways in which plant science research currently takes place. Founded by entrepreneurs Alexis Moschopoulos and Richard Banks, Swinton-based Grobotic Systems Ltd designed and manufactured the chamber which is engineered to streamline the process of growing plants under precise controlled environmental conditions for scientific experimentation. The duo expect to launch the product to market by the end of 2018 after it has undergone rigorous testing in UK universities, facilitated by a £500 grant from UK Steel Enterprise's (UKSE's) Kickstart scheme, and upon consolidation of the results of a global market research campaign. Comprising of a stainless-steel cabinet, LED lights and temperature and humidity control, the chamber will simulate specific environmental conditions allowing scientists to track and monitor plant growth and development to a degree that was previously limited by outdated technology. Having met at university, both Alexis and Richard have left their careers in plant genetics and IT to launch the business and design the product which they say will be "the future of plant science and research." Alexis Moschopoulos PhD, managing director of Grobotic Systems (pictured, front), said: "Filing a patent is a big step forward, putting us one step closer to the launch of the product. "Throughout my career in plant science research I've relied upon plant growth chambers and having remained largely unchanged since their first introduction in the 1960s, current models are hugely expensive, very unreliable and lack the precision needed for many types of experiments. 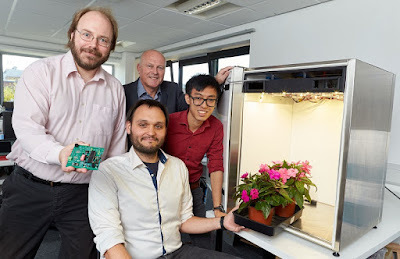 "After working in research laboratories in The University of Sheffield and The University of Leeds for the last five years, I decided to set up Grobotic Systems because I believe our innovative plant growth chambers will be instrumental in the progression of plant science and is a tool that will be of great benefit to the industry for years to come." UKSE is the subsidiary of Tata Steel tasked with helping the economic regeneration of communities affected by changes in the steel industry. Allan Wood of UKSE (pictured, back), said: "Alexis and Richard clearly have a real passion for this industry and have devised a product that when put to market will provide universities and research institutions with the capacity to improve the accuracy and efficiency of experiments and resultant data collection. "The business appears to have good growth opportunities ahead and we hope it can quickly establish its place in the market."